We had our Law Society training in The Centre, and W, L, K, Y, G and I decided to go to Shore during our one-hour lunch break as Shore is situated in L Place, next to The Centre on Queen’s Road Central. Right above Linguini Fini, Shore is split over the third and fourth floors of the building, with the bar and outdoor terrace called “Off Shore” on the third floor, and the main dining room called “On Shore” on the fourth floor. 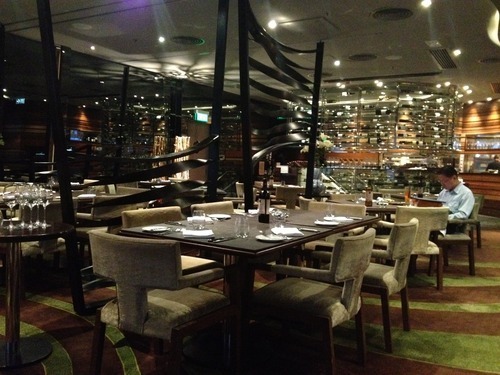 Shore, which opened in September 2010, is renowned for their premium steaks, and even boasts their own dry aging facilities. Even though there are no macarons on the menu, it is perhaps worth noting that Executive Chef Jason Black has recently taken a pastry course with in Paris with renowned chef Pierre Hermé! The interior of Shore is comfortable and sumptuous, complete with luxurious velvet chairs. The dining room is in predominantly brown and grey tones. Shore is a popular venue for company events and my friends and I love coming here for drinks, but it was our first time having a meal here. There are set lunches at $228 for 2 courses and $268 for 3 courses. Being sad (or, shall we say, meticulous) lawyers that we were, we called the restaurant beforehand to ensure that we could finish our meal within one hour! (1) For appetisers, we started off with this light salad of prawn with fennel, orange, and frisee. While the prawns were succulent and the orange added a refreshing fruity touch, this appetiser was very bland overall. 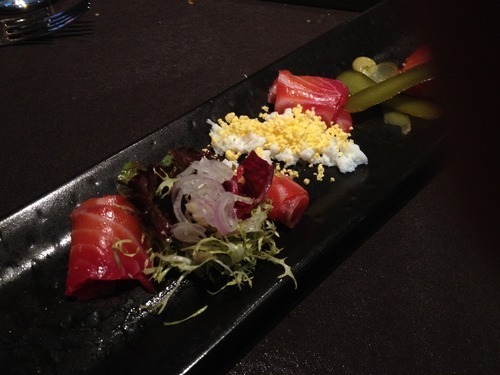 (2) This was followed by the beetroot cured salmon, with egg, capers, cornichons, lemon and parsley dressing. This beautifully presented dish was better than the first one, with lovely textures from the salmon, eggs and salad coming nicely together. Notice how the salmon was a bit red due to beetroot juice! 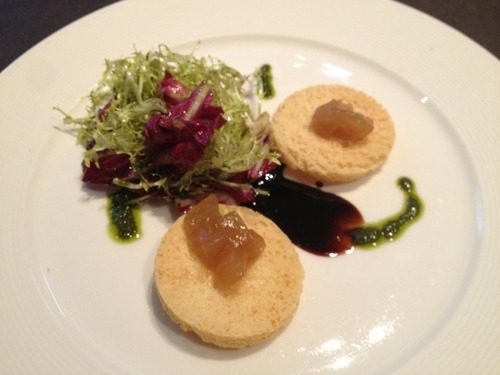 (3) I also tried this torchon of foie gras with spiced apple jam, served on brioche toast. If anything, I liked the sweet vinaigrette dressing, but the apple jam was too sour and the combined taste was very weak. (4) Having been let down by Shore’s appetisers, the restaurant suddenly charmed us when it came to the main courses. Shore is so serious about its steaks that it has its very own “Meat Bible”, which details a wide variety of choice cuts from steak producing countries all over the world. This charcoal grilled Cape Grim Hanging Tender Steak, served with wild sauteed wild mushroom and potato gratin was bound to impress. We asked for medium rare and it was exactly what we got. 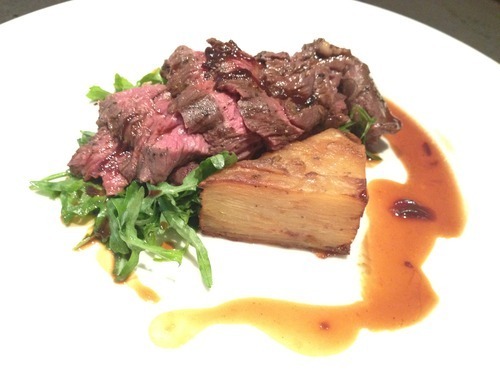 The steak had a pliable, tender texture and the meaty flavours were gorgeous and intense. 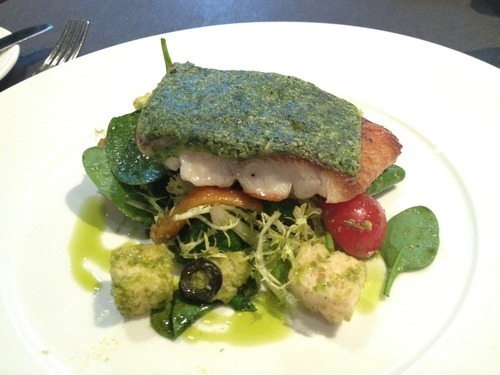 (5) This herb crusted cod dressed in herb vinaigrette and served with cherry tomato panzanella salad on the side was another winner. The cod had a stunning taste, and was aromatic and juicy. The fried skin was deliciously crispy and the herb vinaigrette was buttery and indulgent! (6) After having some excellent fish and steak, the crispy skinned pork belly was just what we needed. 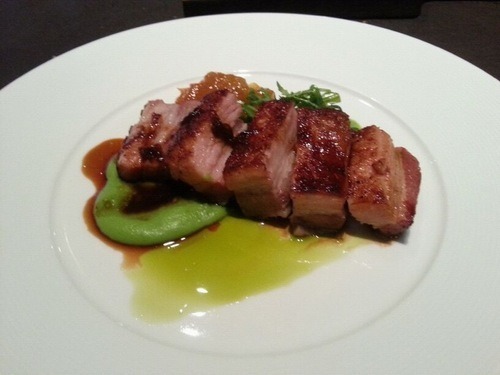 The pork belly was melt-in-your-mouth soft, and was even better than the ones at Liberty Private Works (Hong Kong) and L’Atelier de Joel Robuchon (London)! 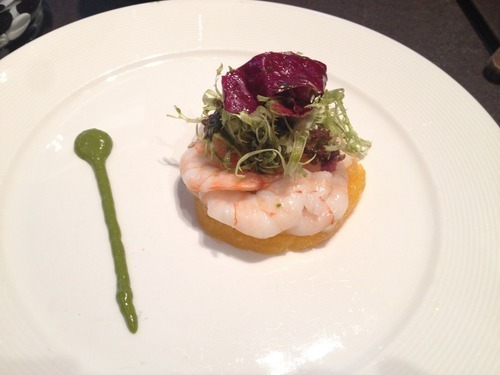 It was served with pea puree, and pineapple chutney, which had scrumptious pineapple bits in it. The fruitiness of the pineapple chutney was a perfect complement with the fatty pork belly, adding a citrus touch to the meat while allowing it to keep its character. However, it was misleading to describe the pork as “crispy skinned”, as the skin wasn’t that crispy at all. The pork belly tasted like Chinese braised pork (in a nice way), and it was a really delightful dish! (7) I was completely amazed by the confit duck and wild mushroom strozzapreti, to the extent that I didn’t remember to take a photo before I dug into it! Strozzapreti is a type of hand-rolled pasta with a funny elongated shape. The pasta was incredibly al dente; the duck confit had an excellent texture and magnificent taste, and was nicely shredded and scattered over the pasta. This awesome dish was then topped with a few delicate slices of grated Parmesan and a small bunch of rocket leaves – it was absolutely gorgeous! Conclusion: We were disappointed at first by the rather unexciting appetisers, but the marvellous meat dishes which followed completely took us by surprise. I chatted with some friends afterwards and was told that the appetisers at dinner are much better – it is definitely a sign that I should come back to Shore for a dinner with friends, followed by drinks on its elegant al fresco terrace!